It may be Spring Break for the kids, but Dianne and I have been extremely busy lately. Spring is huge part of the business season for the Oklahoma wineries Dianne supports and at my job I have been filling in for some peers. The result is that despite the recently warm weather, we have not gotten much time for paddling. Thankfully, we have few spots we can go to quickly. When time is short, we usually paddle our local lakes or the Deep Fork River. Since the construction of the new boat ramp on Deep Fork, we have taken to calling it "Dryfoot Landing". As kayakers, we normally don't think much about boat ramps. However, Deep Fork has exceptionally sticky mud on the banks making the concrete boat ramp a welcome addition to this paddling spot. It is this sticky read mud that makes Deep Fork somewhat less-than-scenic to my eye. The landscape is almost monochromatic in a dull brick red color (examples). I often have a frustratingly tough time making cool pictures on Deep Fork, but this time nature provided a colony of herons for me to photograph. Knowing virtually nothing about birds, I have always called the tall wading birds in our area 'cranes'. It turns out the what I had been calling a crane was often a very cool looking bird called the Great Blue Heron. One way to tell the difference between cranes and herons is by their nests. 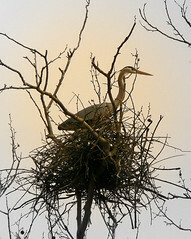 Cranes nest alone on the ground and herons nest in treetop communities. The least time we paddled the Deep Fork River we paddled right up to a heron community tree just loaded with herons. See the Great Blue Herons Flickr Picture Set we created of the occasion. They aren't going to get Mutual Of Omaha to hire Dianne and I for Wild Kingdom 2007, but we enjoyed watching the heron colony for sometime and took loads of pictures. Oklahoma Paddling Tip: Lake paddling can be a bit of a bummer on the kind of windy days that are so common in Oklahoma. Curvy rivers like Deep Fork offer quite a bit of wind break and tend to be less wavy due to fewer boat wakes. Like many fairly new reservoir lakes in Oklahoma, Dripping Springs Lake near Okmulgee, Oklahoma is full of drowning trees. The tree corpses poke up from the lake's surface like weird arms grasping at the sky. Their reflections seem to spell out strange words as the shadows lengthen at sunset. Anytime I paddle there around sunrise or sunset, I see loads of potential pictures. I love taking pictures from my kayak and luckily for me, Clovis Point RV campground on Dripping Springs is real close to home. Here's a link to our Flickr set of Dripping Spring Lake pictures. Surfer-style boardshorts are great for kayak paddling. They drip dry ultra-fast and are all-day comfortable unlike most bathing suits.